It’s been a good year for Bob Cury at RJC Yachts as his central listing, Broward’s 43.3m motor yacht Cocoa Bean, is now sold with Blake Shaw & Co. bringing the buyer. A custom built tri-deck yacht from 1997, she has $1 million worth of sound insulation allowing her to be whisper quiet while underway. A Robin Rose interior features an enormous main saloon, dining saloon and a large on-deck master suite with a private office. 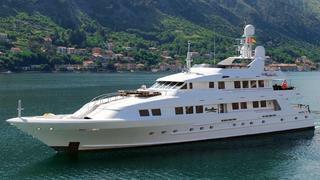 Four additional luxurious staterooms are below deck all with ensuite baths. Outdoor areas include two oversized after decks, vast flybridge and a sundeck with Jacuzzi. Cocoa Bean was asking $10.9 million and was originally listed by Bob in September 2009.